PESHAWAR, Pakistan, Jan 12 2015 (IPS) - At 46, Naseema Nashad is starting her life over, not out of choice but out of necessity. The Afghan woman was just 25 years old when Taliban militants stormed Kabul and her family was forced to flee to neighbouring Pakistan to escape what they knew would be a brutal regime. But in 1999, “for no reason” she says, the Taliban killed Nashad’s father. Since then, it has been a daily struggle for the family to survive. Aged 12, 14 and 15, her three brothers quickly found work in local hotels, though they were paid paltry salaries for their labour. Nashad, on the other hand, could never land anything but odd jobs, which barely gave her enough to survive. What she needed was something fulltime, ideally work she could do from home, that would bring her a regular income. It was a pipe dream at first, but thanks to the efforts of a vocational centre established by the Afghan Women Organisation, an NGO based in this border city, she is close to making it a reality. “Now, I have learnt stitching and embroidery and will open a home-based shop very soon. Some of the women who have previously been trained at the centre are helping me,” she added. She is one of thousands of women, all from war-affected families, who have acquired embroidery and sewing skills over the past five years. Each woman has her own unique story. Fourteen-year-old Gul Pari, for instance, migrated to Peshawar from Afghanistan seven years ago. As a daily wage-labourer, her father could scarcely make ends meet. There was little choice but for his young daughters to go out in search of work. Today, Gul and her younger sister Jamila are the owners of a small home-based business, where they take on clients who need garments stitched or altered. They still in a simple mud hut, but at least they now make enough money to comfortably feed the entire family. Safoora Stanikzai, who heads the Afghan Women Organisation, says she has imparted skills to about 4,000 women since establishing the centre in 2010. “A majority of the trained women were either widows or orphaned children who had lost their male family members in Afghanistan and were facing severe economic problems here,” Stanikzai tells IPS. The organisation lacks space and sufficient resources but soldiers on with the little it has. After the women complete their training, they even receive a sewing machine from the centre to facilitate home-based enterprises. Stanikzai also recruits women found begging on the streets and in marketplaces, and offers them the chance to start their lives afresh – a rare opportunity in this war-torn region, where civilians are often caught between militants and the military, and a massive number of internally displaced persons (IDPs) jostle for space with a resident population already battling a scarcity of homes, jobs and food. According to the U.N. Refugee Agency, Pakistan is home to 1.6 million ‘legal’ Afghan residents, while an estimated two to three million undocumented refugees are also believed to have crossed the 2,700-km-long border since the 1979 Soviet invasion. Passing easily through various unguarded or unchecked entry points in the mountains that form a rocky border between the two nations, Afghans fleeing the war were once welcomed by their brethren in the Federally Administered Tribal Areas (FATA) and what was formerly known as the North-West Frontier Province, now called KP. But when the U.S.-invasion of Afghanistan pushed former Taliban militants into the mountains, leading to a rise in armed groups operating with impunity in the tribal belt, the hand of friendship was snatched away and many Afghans now live on the margins, blamed for the rise in militancy and soaring crime in Pakistan’s northern regions. According to Ahmed Rasool, a professor of international relations at Kabul University, poverty-stricken Afghan refugees have no choice but to remain in Pakistan since they have little to no economic opportunity back home. “The worst victims of the three-decade-long conflict are women, who have lost their fathers, husbands and male family members [and] are finding it hard to earn a living,” he told IPS. Some of these widows and orphans are new arrivals, joining the wave that fled Afghanistan in 2001. Others have lived here much longer, and consider Pakistan their home. But aid that was once was abundant has dwindled. International NGOs and aid agencies followed closely on the heels of departing foreign troops, leaving Afghan refugees in the lurch. Barely able to meet the needs of its own impoverished population in the north, the Pakistan government has offered little assistance to visitors who are now being told they have outstayed their welcome. So initiatives like Stanikzai’s vocational centre represent a welcome oasis in an increasingly hostile desert. Women like 49-year-old Shamin Ara, who received training at the centre five years ago, is just one of the organisation’s many success stories. She arrived in Pakistan in 1992, and lost her father to tuberculosis six years ago. His death left the family no choice but to seek alms from their rich relatives, she tells IPS. Now she earns about 150 dollars a month by practicing the skills she learned at the centre. It is a decent wage in a country where the average annual income is 1,250 dollars. She says she has not yet been able to find a husband, since she still lives in abject poverty. But at least now she can feed her four siblings, and harbours dreams of expanding her business further. 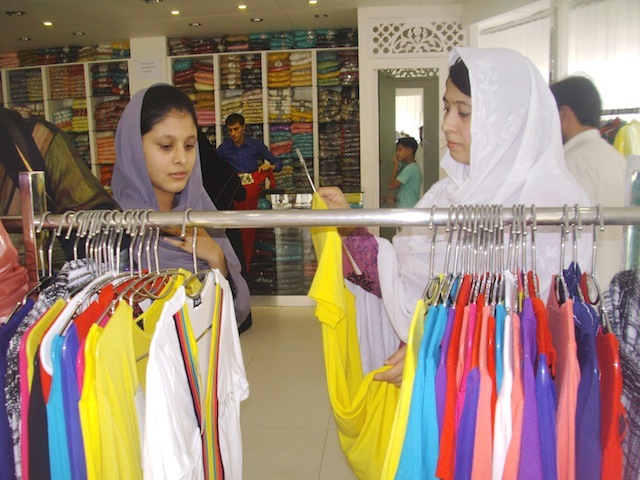 Already she has helped five other Afghan women set up their own shops, and hopes to do more for those like herself, who just need a helping hand.